This mod offers a lot of options to configure HUD modules as well as adds 3D markers for quest and NPC tracking and makes several improvements to game menus. You can use all of the options mod has or turn the ones you don't need off. fixed a problem with quest 3D markers not working properly in Velen. added an option to make 3D markers transparent (0-100% slider). - added explanations about 3D markers visibility options into the readme. - fixed weird behavior of 3D markers for additional user map markers. - fixed a problem with NPC chatter subtitles "randomly" becoming transparent. WARNING! Huge update, install by removing previous version first! 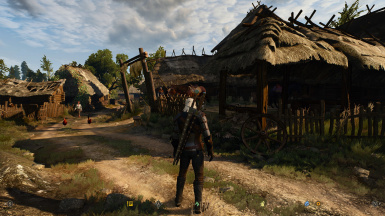 - removed sword sheathe option and witcher sense toggle option (see my TW3 Gameplay Tweaks file). - fixed an issue with true item price and percentage ratio calculations, numbers should be more precise now. - 1.31 non-GOTY and 1.31 GOTY compatibility (sorry for the inconvenience with double-update). - options added to select main menu animation and to hide installed DLC icons. - fixed a bug with "Pin Module" modifier not working properly. - default setting for pausing Cat when not in dark place is set to false (won't affect your current settings). 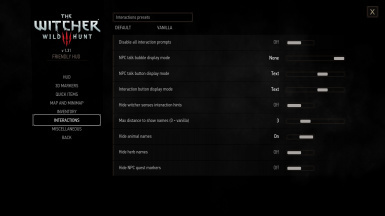 * separate option added to disable interaction hints in witcher senses. Important! Menu options file was updated, so you need to repeat modFHUDConfig.xml copying step (see the readme) and also initialize new options in game menu! - fixed a problem with not being able to assign overlapping hold-to-see and menu hotkeys (make sure you switch "Unlock bindings" on first if you want to do this). - added README.pdf - a guide with lots of screenshots. - tabs collapsed feature was removed as since patch 1.30 your tabs and filters get saved. - can now buy missing alchemy ingredients from alchemist/herbalist directly from alchemy menu by right clicking on them (same as crafting ingredients since patch 1.21). - "Potions tab opens by default" menu switch changed to "Default inventory tab" slider. - some of the translations updated. - fixed a bug with new recipes and crafting schematics marks disappearing after reloading. - with author's permission added "mark new recipes and crafting schematics" feature from Enhanced Menus mod, which is no longer supported. added Chinese translation of new menu items by mbcz123. added Italian translation of new menu items by aeN. added Brazilian Portuguese translation of new menu items by triskl3. added German translation of new menu items by Yesin. also sound is now playing when equipping a bomb. - moved around pieces of the code inside playerInput.ws file for less merging conflicts. - no more options for campfire-only meditation, use Preparations mod instead. integrated minor patches into main version. removed bugged show quest HUD module on journal update feature, introduced in 8.4.3.
fixed a bug with companion module showing up when there's no companion. - fixed a bug with available mini-quest exclamation markers not showing properly for NPCs. by default healthbar is not shown for natural vitality regeneration. fixed problem with incorrect input.xml file in "modFriendlyHUD hotkeys definition"
- NPCs that are quest targets of any of the currently active quests are now show their quest icons regardless of whether their quest is currently tracked or not. - an option to show wolf head module on falling damage added. 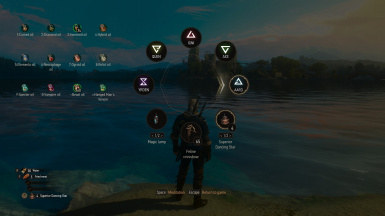 all the UI options should also work for Ciri now. health and potions only refill when meditating for certain amount of time (one hour by default). should not force NPC chatter display on anymore. Switching some parts of the HUD off allows for more immersive gameplay. But playing without minimap or healthbar can be as painful under certain circumstances as it's fantastic while just exploring the world. This mod offers a lot of options to configure HUD modules as well as adds 3D markers for quest and NPC tracking and makes several improvements to game menus. You can use all of the options mod has or turn the ones you don't need off. The mod doesn't change any of the balance aspects of the game and only provides pieces of information to the player he/she already has access to. By installing it you won't be making the game easier or unrealistic, it's an UI mod, which aims to improve quality of life and immersion. Note: This mod doesn't change your save files, so installing or uninstalling it in the middle of playthrough is safe. Unification patch is required for this mod to work properly. 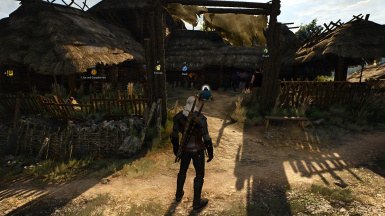 It is now recommended to use the newly released TW3 Mod Manager to install the mod. It handles installing the mod itself, the menu, the hotkeys and user settings automatically. All you need to do is run the Script Merger to fix script conflicts with another mod(s), if you have any. 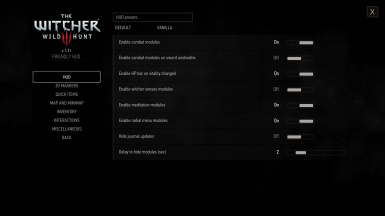 Here's a guide on using Mod Manager and here's a basic guide on installing TW3 mods in general. Please, read both before posting about script errors. You can uninstall the mod fully with one click using TW3 Mod Manager. For manual install/uninstall instructions, please, refer to the readme file. No matter which install method you prefer, read the readme file for mod defaults and configuration explanations! 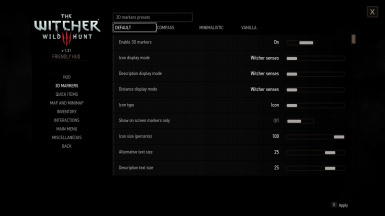 Basic guide to installing TW3 mods. - Smart HUD: turn off all HUD modules for clean uncluttered view during exploration and the mod will automatically show different groups of modules when they're needed - when in combat, losing vitality or using witcher senses, etc. - Quick access to hidden HUD modules with "hold to see" and "pin it" features: holding a hotkey shows corresponding group of modules and releasing it hides it; holding "pin module" modifier key pins corresponding group of modules until you unpin it. Hotkeys can overlap with corresponding vanilla menu hotkeys (as menus are accessed by pressing a key not holding it), so you don't need to keep in mind dozens of new key bindings. - An option to hide journal updates HUD module - the one that shows updated quest name, quest items received, books received, level up and other quest related messages and can never be switched off using vanilla menu. - 3D markers for map locations and NPCs: shows map/minimap markers as icons in game world. Can be used instead of minimap or along with it. There are a lot of options to configure markers' appearance as well as when and which markers to show. - Non-intrusive Skyrim like compass: can be used instead of minimap (or along with it) and together with 3D markers. - Configurable interaction markers and text: switch talk bubble/text over NPCs heads on and off or switch all interaction buttons/text off completely. - Quest markers for quest NPCs: fixes vanilla bug (or weird feature) with not displaying quest markers for NPCs if you're not tracking their specific quest. Can be switched off. - Configurable zoom levels for minimap. By default minimap is zoomed out twice compared to vanilla. - Quick access to potions, bombs and oils via Radial Menu using hotkeys/WASD/controller D-Pad. - Quick switching between crossbow and latest used bomb. - Pause game at any time you like, even in dialogs and cutscenes (except prerendered movies). - Access main menu whenever you need it, even from dialogs and cutscenes/prerendered movies. - Configurable zoom values for map menu with an ability to switch unlimited zoom on (already enabled by default). - Configurable default inventory tab - choose which tab will be selected when opening inventory menu. - New item marker for junk, crafting and edibles never shows up and all such items are automatically marked as being seen already (can be switched off). - True item price and price comparison while bartering is shown beside buying/selling price as well as how many of this item you already have (in stash and total). - Recycling parts you get when dismantling an item are shown in item description. - New recipes and crafting schematics are now marked with asterisks making them easier to find. - Patch 1.22 feature where you can buy crafting ingredients from blacksmiths directly while examining crafting schematic in crafting menu is added to alchemists: you can now buy alchemy ingredients from alchemists directly while examining alchemy recipe in alchemy menu. - Patch 1.22 feature where you can split stack of items when moving it to stash was improved: you can now also split stack of items when moving it from stash back into your inventory. - Selectable main menu animation (default, random, base game, HoS, B&W). - An option to disable sound notification on journal update. - An option to pause cat effect outside of caves and to unpause it at night. Friendly Stash by me. Merge with Script Merger. Friendly Meditation by me. Merge with Script Merger. Preparations by me. Merge with Script Merger. All Quest Objectives On Map by Wolfmark. Merge with Script Merger. Colored Map Markers by DJ_Kovrik. Sort Everything by DJ_Kovrik. Merge with Script Merger. Alternate Lightsources Interaction by DJ_Kovrik. - AnotherSymbiote for No Talk Icon mod (original code used with his permission). - ExtravagantAardvark for Nonintrusive Compass Directions mod (included by his request). - Janiskeisari for Enhanced Menus mod (included features still missing in vanilla with his permission, the mod is no longer supported since patch 1.21). - Yesin and ​X​y​arvius​ for German translation. - triskl3 for Brazilian Portuguese translation. - aeN and BlackHole11 for Italian translation. - pat_sch for French translation. - mbcz123 for Chinese translation. - BowmoreLover for Japanese translation. - iguruspain for Spanish translation. - Arthandas9 for Polish translation. - jamalzzou for Arabic translation. - gf159 for Hungarian translation. - MrFreemium for Turkish translation. - DJ_Kovrik for HUGE help with icons for 3D markers.